Feces, colloquially known as poop, are the solid or semisolid remains of the food that could not be digested in the small intestine. Bacteria in the large intestine further break down the material. Feces contain a relatively small amount of metabolic waste products such as bacterially altered bilirubin, and the dead epithelial cells from the lining of the gut. Typhoid vaccines are vaccines that prevent typhoid fever. Several types are widely available: typhoid conjugate vaccine (TCV), Ty21a and Vi capsular polysaccharide vaccine (ViPS). They are about 30 to 70% effective for the first two years depending on the specific vaccine in question. The Vi-rEPA vaccine has been shown to be efficacious in children. 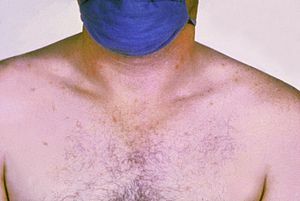 In medicine, the Faget sign — sometimes called sphygmothermic dissociation — is the unusual pairing of fever with bradycardia. The Faget sign is named after Louisiana physician Jean Charles Faget, who studied yellow fever in Louisiana. Typhidot is a medical test consisting of a dot ELISA kit that detects IgM and IgG antibodies against the outer membrane protein (OMP) of the Salmonella enterica subsp. enterica. The typhidot test becomes positive within 2–3 days of infection and separately identifies IgM and IgG antibodies. The test is based on the presence of specific IgM and IgG antibodies to a specific 50Kd OMP antigen, which is impregnated on nitrocellulose strips. IgM shows recent infection whereas IgG signifies remote infection. The most important limitation of this test is that it is not quantitative and the result is only positive or negative. As resistance to ampicillin, chloramphenicol, trimethoprim-sulfamethoxazole, and streptomycin is now common, these agents have not been used as first–line treatment of typhoid fever for almost 20 years. [ citation needed ] Typhoid resistant to these agents is known as multidrug-resistant typhoid (MDR typhoid). 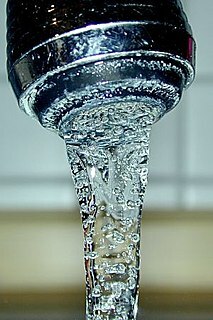 A separate problem exists with laboratory testing for reduced susceptibility to ciprofloxacin: current recommendations are that isolates should be tested simultaneously against ciprofloxacin (CIP) and against nalidixic acid (NAL), and that isolates that are sensitive to both CIP and NAL should be reported as "sensitive to ciprofloxacin", but that isolates testing sensitive to CIP but not to NAL should be reported as "reduced sensitivity to ciprofloxacin". However, an analysis of 271 isolates showed that around 18% of isolates with a reduced susceptibility to ciprofloxacin (MIC 0.125–1.0 mg/l) would not be picked up by this method. How this problem can be solved is not certain, because most laboratories around the world (including the West) are dependent on disk testing and cannot test for MICs. In 1880, Karl Joseph Eberth described a bacillus that he suspected was the cause of typhoid. In 1884, pathologist Georg Theodor August Gaffky (1850–1918) confirmed Eberth's findings,  and the organism was given names such as Eberth's bacillus, Eberthella Typhi, and Gaffky-Eberth bacillus. 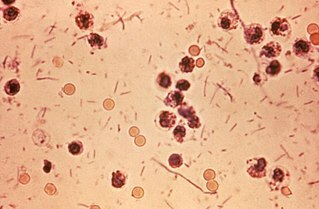 Today, the bacillus that causes typhoid fever goes by the scientific name Salmonella enterica enterica , serovar Typhi. The British bacteriologist Almroth Edward Wright first developed an effective typhoid vaccine at the Army Medical School in Netley, Hampshire. It was introduced in 1896 and used successfully by the British during the Boer War in South Africa. At that time, typhoid often killed more soldiers at war than were lost due to enemy combat. Wright further developed his vaccine at a newly opened research department at St Mary's Hospital Medical School in London from 1902, where he established a method for measuring protective substances (opsonin) in human blood. A super-spreader is a host—an organism infected with a disease—that infects, disproportionately, more secondary contacts than other hosts who are, also, infected with the same disease. A sick human can be a super-spreader; they would be more likely to infect others than most people with the disease. Super-spreaders are thus of high concern in epidemiology. Edward T. (Thomas) Ryan is an American microbiologist, immunologist, and physician at Harvard University and Massachusetts General Hospital. Ryan served as President of the American Society of Tropical Medicine and Hygiene from 2009-2010. Ryan is Professor of Immunology and Infectious Diseases at the Harvard T.H. Chan School of Public Health, Professor of Medicine at Harvard Medical School, and Director of Global Infectious Diseases at the Massachusetts General Hospital. Ryan's research and clinical focus has been on infectious diseases associated with residing in, immigrating from, or traveling through resource-limited areas. Ryan is a Fellow of the American Society of Microbiology, the American Society of Tropical Medicine and Hygiene, the American College of Physicians, and the Infectious Diseases Society of America. This is a Timeline of typhoid fever, describing major events such as scientific/medical developments and notable epidemics. 1 2 3 4 Anna E. Newton (2014). "3 Infectious Diseases Related To Travel". CDC health information for international travel 2014 : the yellow book. ISBN 9780199948499. Archived from the original on 2015-07-02. 1 2 3 4 5 6 7 8 9 10 11 "Typhoid Fever". cdc.gov. May 14, 2013. Archived from the original on 6 June 2016. Retrieved 28 March 2015. 1 2 3 4 5 6 7 8 9 10 11 12 13 14 Wain, J; Hendriksen, RS; Mikoleit, ML; Keddy, KH; Ochiai, RL (21 March 2015). "Typhoid fever". Lancet. 385 (9973): 1136–45. doi:10.1016/s0140-6736(13)62708-7. PMID 25458731. 1 2 3 4 5 6 7 8 9 10 "Typhoid vaccines: WHO position paper" (PDF). Wkly Epidemiol Rec. 83 (6): 49–59. February 8, 2008. PMID 18260212. Archived (PDF) from the original on April 2, 2015. 1 2 3 Crump, JA; Mintz, ED (15 January 2010). "Global trends in typhoid and paratyphoid Fever". Clin Infect Dis. 50 (2): 241–6. doi:10.1086/649541. PMC 2798017 . PMID 20014951. 1 2 3 4 5 6 7 8 "Typhoid Fever". cdc.gov. May 14, 2013. Archived from the original on 2 April 2015. Retrieved 28 March 2015. 1 2 3 Milligan, R; Paul, M; Richardson, M; Neuberger, A (31 May 2018). "Vaccines for preventing typhoid fever". The Cochrane Database of Systematic Reviews. 5: CD001261. doi:10.1002/14651858.CD001261.pub4. PMID 29851031. 1 2 GBD 2015 Disease and Injury Incidence and Prevalence, Collaborators. (8 October 2016). "Global, regional, and national incidence, prevalence, and years lived with disability for 310 diseases and injuries, 1990–2015: a systematic analysis for the Global Burden of Disease Study 2015". Lancet. 388 (10053): 1545–1602. doi:10.1016/S0140-6736(16)31678-6. PMC 5055577 . PMID 27733282. ↑ Alan J. Magill (2013). Hunter's tropical medicine and emerging infectious diseases (9th ed.). London: Saunders/Elsevier. pp. 568–572. ISBN 9781455740437. Archived from the original on 2017-02-28. ↑ Chatham-Stephens, K; Medalla, F; Hughes, M; Appiah, GD; Aubert, RD; Caidi, H; Angelo, KM; Walker, AT; Hatley, N; Masani, S; Nash, J; Belko, J; Ryan, ET; Mintz, E; Friedman, CR (11 January 2019). "Emergence of Extensively Drug-Resistant Salmonella Typhi Infections Among Travelers to or from Pakistan - United States, 2016-2018". MMWR. Morbidity and Mortality Weekly Report. 68 (1): 11–13. doi:10.15585/mmwr.mm6801a3. PMC 6342547 . PMID 30629573. ↑ Jackson, BR; Iqbal, S; Mahon, B (27 March 2015). "Updated Recommendations for the Use of Typhoid Vaccine – Advisory Committee on Immunization Practices, United States, 2015". Morb Mortal Wkly Rep. 64 (11): 305–308. PMC 4584884 . PMID 25811680. ↑ Cunha BA (March 2004). "Osler on typhoid fever: differentiating typhoid from typhus and malaria". Infect Dis Clin N Am. 18 (1): 111–25. doi:10.1016/S0891-5520(03)00094-1. PMID 15081508. ↑ "Typhoid". Merriam Webster Dictionary. Archived from the original on 2013-07-02. Retrieved 2013-06-24. ↑ Kumar P, Kumar R (2016). "Enteric Fever". Indian J Pediatr. 84 (3): 227–230. doi:10.1007/s12098-016-2246-4. PMID 27796818. ↑ "Typhoid Fever Information for Health Professionals". CDC. May 14, 2013. Archived from the original on 20 August 2016. Retrieved 20 August 2016. ↑ Yap, Kien-Pong; et al. (2016). "Global MLST of Salmonella Typhi Revisited in Post-genomic Era: Genetic Conservation, Population Structure, and Comparative Genomics of Rare Sequence Types". Front Microbiol. 7: 270. doi:10.3389/fmicb.2016.00270. PMC 4774407 . PMID 26973639. 1 2 3 4 5 Eng, SK; Pusparajah, P; Mutalib, NS; Ser, HL; Chan, KG; Lee, LH (9 June 2015). "Salmonella:A review on pathogenesis, epidemiology and antibiotic resistance". Taylor & Francis Online. 8 (3): 284–293. doi:10.1080/21553769.2015.1051243. 1 2 Parry CM, Beeching NJ (2009). "Treatment of enteric fever". Br Med J. 338: b1159. doi:10.1136/bmj.b1159. PMID 19493937. ↑ "The Great Horse Manure Crisis of 1894". Archived from the original on 2015-05-25. ↑ Anwar, E; Goldberg, E; Fraser, A; Acosta, CJ; Paul, M; Leibovici, L (2 January 2014). "Vaccines for preventing typhoid fever". Cochrane Database Syst Rev (1): CD001261. doi:10.1002/14651858.CD001261.pub3. PMID 24385413. ↑ Marathe, Sandhya A.; Lahiri, Amit; Negi, Vidya Devi; Chakravortty, Dipshikha (2012). 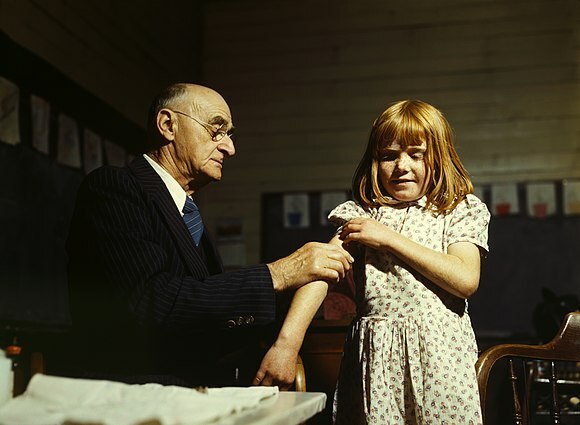 "Typhoid fever & vaccine development: a partially answered question". Indian J Med Res. 135 (2): 161–169. ISSN 0971-5916. PMC 3336846 . PMID 22446857. 1 2 3 Date, Kashmira A.; Bentsi-Enchill, Adwoa; Marks, Florian; Fox, Kimberley (2015-06-19). "Typhoid fever vaccination strategies". Vaccine. 33: C55–C61. doi:10.1016/j.vaccine.2015.04.028. PMID 25902360. ↑ Date, Kashmira A.; Bentsi-Enchill, Adwoa; Marks, Florian; Fox, Kimberley (June 2015). "Typhoid fever vaccination strategies". Vaccine. 33: C55–C61. doi:10.1016/j.vaccine.2015.04.028. PMID 25902360. ↑ health, NPS: Better choices, Better. "Vivaxim Solution for injection". NPS MedicineWise. Archived from the original on 1 October 2015. Retrieved 10 April 2017. 1 2 Effa EE, Lassi ZS, Critchley JA, Garner P, Sinclair D, Olliaro PL, Bhutta ZA (October 2011). "Fluoroquinolones for treating typhoid and paratyphoid fever (enteric fever)". Cochrane Database Syst Rev (10): CD004530. doi:10.1002/14651858.CD004530.pub4. PMID 21975746. ↑ Soe GB, Overturf GD (1987). "Treatment of typhoid fever and other systemic salmonelloses with cefotaxime, ceftriaxone, cefoperazone, and other newer cephalosporins". Rev Infect Dis. 9 (4): 719–36. doi:10.1093/clinids/9.4.719. JSTOR 4454162. PMID 3125577. ↑ Wallace MR, Yousif AA, Mahroos GA, Mapes T, Threlfall EJ, Rowe B, Hyams KC (1993). "Ciprofloxacin versus ceftriaxone in the treatment of multiresistant typhoid fever". Eur J Clin Microbiol Infect Dis. 12 (12): 907–910. doi:10.1007/BF01992163. PMID 8187784. ↑ Dutta P, Mitra U, Dutta S, De A, Chatterjee MK, Bhattacharya SK (2001). 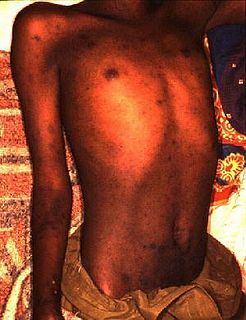 "Ceftriaxone therapy in ciprofloxacin treatment failure typhoid fever in children". Indian J Med Res. 113: 210–3. PMID 11816954. ↑ Коваленко А.Н. ; et al. (2011). "Особенности клиники, диагностики и лечения брюшного тифа у лиц молодого возраста". Voen.-meditsinskii Zhurnal. 332 (1): 33–39. ↑ Bhutta ZA, Khan IA, Molla AM (1994). "Therapy of multidrug-resistant typhoid fever with oral cefixime vs. intravenous ceftriaxone". Pediatr Infect Dis J. 13 (11): 990–993. doi:10.1097/00006454-199411000-00010. PMID 7845753. ↑ Cao XT, Kneen R, Nguyen TA, Truong DL, White NJ, Parry CM (1999). "A comparative study of ofloxacin and cefixime for treatment of typhoid fever in children. The Dong Nai Pediatric Center Typhoid Study Group". Pediatr Infect Dis J. 18 (3): 245–8. doi:10.1097/00006454-199903000-00007. PMID 10093945. ↑ "WHO | Typhoid fever". www.who.int. Archived from the original on 2017-07-27. Retrieved 2017-08-10. ↑ Cooke FJ, Wain J, Threlfall EJ (2006). 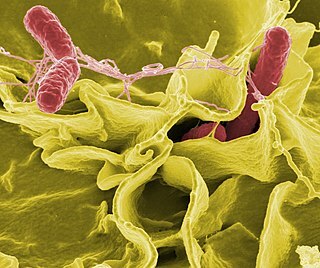 "Fluoroquinolone resistance in Salmonella Typhi (letter)". Br Med J. 333 (7563): 353–354. doi:10.1136/bmj.333.7563.353-b. PMC 1539082 . PMID 16902221. ↑ Crump JA, Mintz ED (2010). "Global trends in typhoid and paratyphoid fever". Clin Infect Dis. 50 (2): 241–246. doi:10.1086/649541. PMC 2798017 . PMID 20014951. 1 2 "Typhoid Fever". World Health Organization. Archived from the original on 2011-11-02. Retrieved 2007-08-28. ↑ Crump JA, Luby SP, Mintz ED (2004). "The global burden of typhoid fever". Bull World Health Organ. 82: 346–353. ↑ Muyembe-Tamfum JJ, Veyi J, Kaswa M, Lunguya O, Verhaegen J, Boelaert M (2009). "An outbreak of peritonitis caused by multidrug-resistant Salmonella Typhi in Kinshasa, Democratic Republic of Congo". Travel Med Infect Dis. 7 (40): 40–43. doi:10.1016/j.tmaid.2008.12.006. PMID 19174300. ↑ Baddam R, Kumar N, Thong KL, Ngoi ST, Teh CS, Yap KP, Chai LC, Avasthi TS, Ahmed N (2012). "Genetic fine structure of a Salmonella enterica serovar Typhi strain associated with the 2005 outbreak of typhoid fever in Kelantan, Malaysia". J Bacteriol. 194 (13): 3565–3566. doi:10.1128/jb.00581-12. PMC 3434757 . PMID 22689247. ↑ Yap, Kien-Pong; et al. (2012). "Insights from the genome sequence of a Salmonella enterica serovar Typhi strain associated with a sporadic case of typhoid fever in Malaysia". J Bacteriol. 194 (18): 5124–5125. doi:10.1128/jb.01062-12. PMC 3430317 . PMID 22933756. ↑ Heymann, David L., ed. (2008), Control of Communicable Diseases Manual , Washington, D.C.: American Public Health Association, pg 665. ISBN 978-0-87553-189-2. ↑ Levine; et al. (1982). "Precise estimation of the numbers of chronic carriers of Salmonella Typhi in Santiago, Chile, an endemic area". J Infect Dis. 146 (6): 724–726. doi:10.1093/infdis/146.6.724. ↑ G Gonzalez-Escobedo; JM Marshall; JS Gunn (2010). "Chronic and acute infection of the gall bladder by Salmonella Typhi: understanding the carrier state". Nat Rev Microbiol. 9 (1): 9–14. doi:10.1038/nrmicro2490. PMC 3255095 . PMID 21113180. ↑ Yap, Kien-Pong; et al. (2012). "Genome sequence and comparative pathogenomics analysis of a Salmonella enterica serovar Typhi strain associated with a typhoid carrier in Malaysia". J Bacteriol. 194 (21): 5970–5971. doi:10.1128/jb.01416-12. PMC 3486090 . PMID 23045488. ↑ Yap, Kien-Pong; et al. (2014). "Comparative genomics of closely related Salmonella enterica serovar Typhi strains reveals genome dynamics and the acquisition of novel pathogenic elements". BMC Genomics. 15 (1): 1007. doi:10.1186/1471-2164-15-1007. PMC 4289253 . PMID 25412680. ↑ Crump, John A.; Sjölund-Karlsson, Maria; Gordon, Melita A.; Parry, Christopher M. (2016-12-15). "Epidemiology, Clinical Presentation, Laboratory Diagnosis, Antimicrobial Resistance, and Antimicrobial Management of Invasive Salmonella Infections". Clin Microbiol Rev. 28 (4): 901–937. doi:10.1128/CMR.00002-15. ISSN 0893-8512. PMC 4503790 . PMID 26180063. ↑ Khan, M. Imran; Pach 3rd, Khan; Khan, Ghulam Mustafa; Bajracharya, Deepak; Sahastrabuddhe, Sushant; Bhutta, Waqaas; Tahir, Rehman; Soofi, Sajid; Thapa, Chandra B. (2015-06-19). "Typhoid vaccine introduction: An evidence-based pilot implementation project in Nepal and Pakistan". Vaccine. 33: C62–C67. doi:10.1016/j.vaccine.2015.03.087. PMID 25937612. ↑ Papagrigorakis MJ, Yapijakis C, Synodinos PN, Baziotopoulou-Valavani E (2006). "DNA examination of ancient dental pulp incriminates typhoid fever as a probable cause of the Plague of Athens". Int J Infect Dis. 10 (3): 206–214. doi:10.1016/j.ijid.2005.09.001. PMID 16412683. ↑ Shapiro B, Rambaut A, Gilbert MT (2006). "No proof that typhoid caused the Plague of Athens (a reply to Papagrigorakis et al.)". Int J Infect Dis. 10 (4): 334–335. doi:10.1016/j.ijid.2006.02.006. PMID 16730469. ↑ Acuna-Soto, R; Stahle, DW; Cleaveland, MK; Therrell, MD (April 2002). "Megadrought and megadeath in 16th century Mexico". Emerging Infectious Diseases. 8 (4): 360–2. doi:10.3201/eid0804.010175. PMC 2730237 . PMID 11971767. ↑ Hersher, Rebecca (2018-01-15). "Salmonella May Have Caused Massive Aztec Epidemic, Study Finds". NRP. Retrieved 2018-01-15. ↑ Vågene, Åshild J.; Herbig, Alexander; Campana, Michael G.; Robles García, Nelly M.; Warinner, Christina; Sabin, Susanna; Spyrou, Maria A.; Andrades Valtueña, Aida; Huson, Daniel; Tuross, Noreen; Bos, Kirsten I.; Krause, Johannes (2018-01-15). "Salmonella enterica genomes from victims of a major sixteenth-century epidemic in Mexico". Nature Ecology & Evolution. 2 (3): 520–528. doi:10.1038/s41559-017-0446-6. PMID 29335577. ↑ Byrne, Joseph Patrick (2008). Encyclopedia of Pestilence, Pandemics, and Plagues: A-M. ABC-CLIO. p. 190. ISBN 978-0-313-34102-1. Archived from the original on 2014-01-03. ↑ McHugh, Jane; Mackowiak, Philip A. (2014-10-01). "Death in the White House: President William Henry Harrison's Atypical Pneumonia". Clin Infect Dis. 59 (7): 990–995. doi:10.1093/cid/ciu470. ISSN 1058-4838. PMID 24962997. ↑ Mchugh, Jane; Mackowiak, Philip A. (2014-03-31). "What Really Killed William Henry Harrison?". The New York Times. ISSN 0362-4331. Archived from the original on 2017-01-20. Retrieved 2017-01-19. ↑ "1900 Flow of Chicago River Reversed". Chicago Timeline. Chicago Public Library. Archived from the original on 2007-03-07. Retrieved 2007-02-08. ↑ "Walter Reed Typhoid Fever, 1897–1911". Archived from the original on 2014-10-06. Retrieved 2014-09-03. , Claude Moore Health Sciences Library. University of Virginia. ↑ "Emsworth Oysters". Emsworth Business Association. 10 February 2019. Archived from the original on 3 February 2016. ↑ Bulstrode, H. Timbrell (1903). "Dr. H. Timbrell Bulstrode's report to the Local Government Board upon alleged oyster-home enteric fever and other illness following the mayoral banquets at Winchester and Southampton, and upon enteric fever occurring simultaneously elsewhere and also ascribed to oysters". London: HMSO: 1. Archived from the original on 19 June 2017. ↑ "Nova: The Most Dangerous Woman in America". Archived from the original on 2010-04-26. ↑ Aronson SM (1995). "William Budd and typhoid fever". R I Med. 78 (11): 310. PMID 8547718. ↑ C. J. Eberth (1880) "Die Organismen in den Organen bei Typhus abdominalis" (Organisms in the [internal] organs in cases of Typhus abdominalis), Archiv für pathologische Anatomie und Physiologie, 81 : 58–74. ↑ C. J. Eberth (1881) "Neue Untersuchungen über den Bacillus des Abdominaltyphus" (New investigations into the bacilli of abdominal typhoid), Archiv für pathologische Anatomie und Physiologie, 83 : 486–501. ↑ Gaffky (1884) "Zur Aetiology des Abdominaltyphus" Archived 2017-04-23 at the Wayback Machine (On the etiology of abdominal typhus), Mittheilungen aus dem Kaiserlichen Gesundheitsamte, 2 : 372–420. ↑ "Sir Almroth Edward Wright". Encyclopædia Britannica. Archived from the original on 2013-11-11. ↑ "Medical lessons from World War I underscore need to keep developing antimicrobial drugs". MinnPost. 2014-11-11. Archived from the original on 30 January 2016. Retrieved 8 September 2017. ↑ USAMRMC: 50 Years of Dedication to the Warfighter 1958–2008 (PDF). U.S. Army Medical Research & Material Command (2008). 2008. p. 5. ASIN B003WYKJNY. Archived (PDF) from the original on 2013-02-14. ↑ Leal, John L. (1909). "The Sterilization Plant of the Jersey City Water Supply Company at Boonton, N.J." Proceedings American Water Works Association. pp. 100–9. ↑ Fuller, George W. (1909). 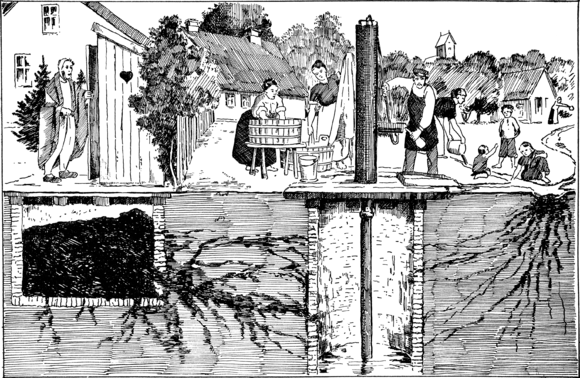 "Description of the Process and Plant of the Jersey City Water Supply Company for the Sterilization of the Water of the Boonton Reservoir." Proceedings American Water Works Association. 110-34. ↑ Dennis, Brady; Dennis, Brady (2011-09-29). "Willie Lincoln's death: A private agony for a president facing a nation of pain". The Washington Post. ISSN 0190-8286. Archived from the original on 2017-04-01. Retrieved 2017-03-12. ↑ Paulley, J.W. (1993). "The death of Albert Prince Consort: the case against typhoid fever". QJM. 86 (12): 837–841. doi:10.1093/oxfordjournals.qjmed.a068768. PMID 8108541. Archived from the original on 2015-12-08. ↑ "A History of Stanford". Stanford University. Retrieved 4 July 2018. ↑ Ruggles, Eleanor (1944) Gerard Manley Hopkins: A Life. Norton. ↑ Scott, Belinda F.. (1910-09-23) Biography – Henry James Herbert Scott – Australian Dictionary of Biography Archived 2011-02-21 at the Wayback Machine . Adbonline.anu.edu.au. Retrieved on 2014-05-12. ↑ "Straw for Silence". The Spectator . Vol. 203. F.C. Westley. 1959. ISSN 0038-6952. OCLC 1766325 . Retrieved March 16, 2011. ↑ "Angolan singer Lourdes Van-Dunem dies of typhoid". 2006. Archived from the original on 4 March 2016. Retrieved 23 October 2015. ↑ "Heath Bell Recovering After Bout With Typhoid Fever on Vacation". AOL News. 2011. Archived from the original on 2 March 2013. Retrieved 17 October 2011. 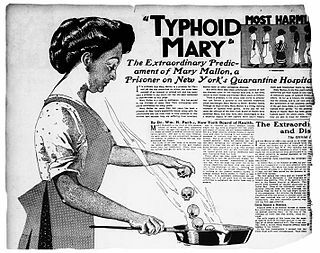 Wikimedia Commons has media related to Typhoid fever .